considering how easily they can conceal an explosive device planted by a terrorist. All our bomb receptacles were successfully tested at the Energetic Materials Research and Testing Center located in Socorro, New Mexico. Live demonstrations were also conducted at the USMC HQ located in Quantico, Virginia. 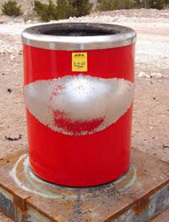 A trash receptacle can become part of an attack that maximizes the intensity of the bomb by spraying shrapnel and fragmentation at great distances. 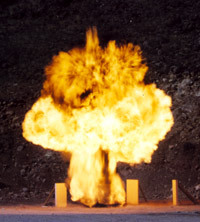 Initial blast is contained horizontally and remaining blast energy is directed vertically. Designed with no metal parts of in the blast path which could fragment and become airborne during an explosion. Designed with a Stainless Steel Lid which remains attached to the waste receptacle. Galvanized edges, walls and drains provide corrosion resistance in most environments. Sturdy galvanized exterior walls are factory covered with metals or standard color and texture laminates. Laminates can also be custom designed with special art, logos or official seals (100 Piece Minimum). Dings and dents will be minimized with laminate over metal and they also resist fading compared to painted surfaces. Laminated exterior can be replaced by a local laminator if damaged or color schemes are revised. Attractive and durable polished stainless steel LID is standard on all models. Top will not discolor from tobacco products and can be cleaned and buffed again and again. Plastic liner accepts multiple size garbage bags , which are easily removed when full. Flexible internal drainage from bottom or side. Spillage can also be stored internally for later clean up and wash down. Technical assistance is also available at no charge via email or phone. On site supervision and/or installation services can be provided for a fee. Americans with Disabilities Act (ADA) compliant. Dimensions: 29" Diameter & 37.5" Height (39" with leveling legs extended). Designed, built, and tested to last , Made in the USA using only US purchased materials.